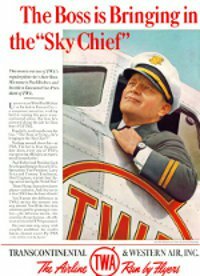 TWA Executive Vice President The pilot's picture featured in the big full page ad released recently entitled "The Boss is Bringing In The Sky Chief" is none other than that of Paul E. Richter, Executive Vice President of TWA. Many of you saw and read that ad. From it you'll know that Paul Richter is a competent pilot with thousands of hours in the air to his credit as well as a remarkable record as an airline executive. We'd like you to know more about him so let's begin with his introduction to Jack Frye, now President of TWA. At that time he was 28 years old and when he walked into Frye's flying school and paid $250.00 in cash to learn to fly, Frye and his partner almost fainted. Richter had gone to California from Denver, where his father had operated an advertising agency. He worked as office boy but advertising and sales were not to his liking. "My ambition was to be an agriculturalist," he recalls. "With this in mind I attended the Colorado agricultural college and when I finished I took over the management of a ranch my father owned in Morgan County." In 1918 Richter joined the army, was commissioned a second lieutenant and failed in an attempt to transfer to the air corps. He was "on the dock" ready to go to Europe when the war ended and he returned to the ranch. As soon as he got a stake he leased the ranch and went to California to learn to fly. "I canvassed every flying school from San Francisco to San Diego and then came upon the one operated by Fuller and Frye," Richter relates. "After I paid up I was turned over to Jack and he taught me to fly. I took Bon MacDougal, daredevil race driver and stunt man on my first solo. The crazy guy got out of the cockpit and went out on the wing. I was worried, but just kept flying. When we landed he offered me a job stunt flying for the movies." Richter became an instructor for the Standard Flying School at $35 a week. He became one of the original "Thirteen Black Cats," those hair-raising stunt men of the early day movies. He climbed out on the wing, hung by his feet, played cards on the top wing and performed similar feats "to earn an honest dollar." He acquired two airplanes, some accessories and had a little of his ranch money left. About this time, three of the school's graduates, Frye, Richter and Hamilton decided to buy it out and form the Aero Corporation of California. Each of the three had something different to contribute--Frye had the vision of the future of aviation, Hamilton was the mechanical genius who could almost turn a washing machine into an airplane engine, and Richter had the stabilizing influence. The school was an immediate success, and Lindbergh had flown the Atlantic so students rushed to them in droves. Advertising by air became the thing--the flyers formed a crop dusting company and spread insect powder all over the San Joaquin and Imperial Valleys and even along the West Coast of Mexico. They took over the agency for Eagle Rock planes and sold over 60 the first year. With the profits from this venture, they started Standard Airlines with Fokker planes. Here was the beginning of the air transport operation for the three men. Their 3-times a week, 1-plane service operated between Los Angeles and Phoenix developed rapidly and was extended to make a daily connection with the railroad at El Paso. From that time on it was just a matter of mergers--first with Western Air Express in 1929, then with Transcontinental Air Transport in October 1930. Through all this, Richter and Frye had remained the closest of friends in their partnership agreement and today as president and executive vice president respectively of TWA, they are continuing the job of building aviation. Although Paul Richter has little time to devote to his hobbies, he is an ardent fisherman and hunter and enjoys all outdoor sports. Flying is one of the things he manages to get in as part of the business. If you ever went hunting with him in the field, you would soon appreciate the care and precision for which he is noted. It's "dead bird" almost before you can get your gun to your shoulder. We know he likes to make these weekend excursions into the Ozarks and on reliable authority it is reported he frequently "doubles" on coveys, and can walk the legs off any average hunter. He enjoys horse back riding and just for good measure, tossed in as neat a steer ride as you could wish for at the Conquistadores Rodeo party last year. Paul Richter is a man's man--he is extremely popular with his employees and friends, and the type of man in whom you are glad to place your confidence.